Did you ever wonder if you could create a temporary result set and use that within a single SELECT, INSERT, UPDATE or DELETE statement? 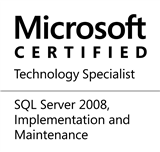 I bet you have, and before SQL Server 2005 came along, I am sure that you used either sub-queries, cursors or temporary tables to achieve the desired results. As is the case with everything, CTEs in excess can also cause more harm than good. CTEs are more of “expandable” blocks of code, and hence, if you use them more than once in a query, you will end up with performance issues. This is because the entire data set is populated the number of times a CTE is used. For cases where you need to use the same data set again and again, use temporary tables or table variables instead. I hope that CTE’s opened up a whole new programming paradigm for all. If you have not started experimenting with CTEs, I recommend that you start doing so – it will be fun. This entry was posted in #SQLServer, Blog, Imported from BeyondRelational and tagged #SQLServer on March 17, 2011 by nakulvachhrajani.